The Oxford English Dictionary defines a coupe as "a car with fixed roof, two doors and a sloping rear". The Germans, it seems, beg to differ. The country's big three car makers, BMW, Mercedes-Benz and Audi, are climbing over each other to reimagine and redefine the coupe concept, applying the name to almost anything with a vaguely sporty appearance - from small sports cars to hulking SUVs and big luxury saloons. This includes the so-called "four door coupe", pioneered by Mercedes with its ground-breaking CLS, which BMW followed soon after with Gran Coupe versions of its 6 Series and 4 Series sports cars. 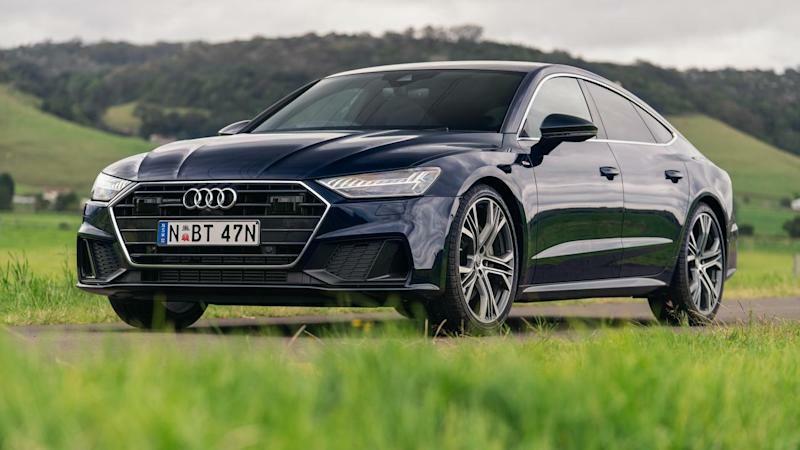 Now Audi has further upped the ante with its new A7 Sportback - described as a four-door coupe even though, technically, it's a five-door hatchback. The good news is that, semantics aside, this exclusive club is home to some of the most impressive and desirable cars on the market. And this sublime, second-generation A7 might just be the best of them. Audi uses the Sportback name for hatchback models across its range - from the A1 and A3 small cars to A5 and A7 luxury sports tourers - and it's a little surprising that we don't see more hatchback vehicles on our roads. They make such good sense, matching sleek and sporty looks with more cargo space and much greater flexibility and serviceability. The A7 is fundamentally a re-skinned version of the A6 executive sedan, sharing chassis, drivetrain and much of their interiors - but this new model also borrows heavily from the flagship A8 limousine in terms of its technology and luxury inclusions. You'll pay a premium for choosing the A7 over the A6 and justifiably so. We drove the top-spec A7 55 TFSI, which will set you back a not-inconsiderable $131,900. There's also a diesel-powered option, the 50 TDI, and a four-cylinder, lesser-specified 45 TFSI model arriving shortly in Australia to lower the A7's entry point to $113k. One word kept springing to mind every time we drove the A7 - glorious. Glorious to look at, glorious to drive and, I suspect, glorious to own. It really is a vehicle that reflects a company at the very top of its game - and that is without a doubt where Audi currently finds itself. As much as we admired the Benz CLS during a recent test, with its flowing, elegant lines and muscular road presence, the A7 felt every bit as special and every bit as beautiful. Which is saying something. Everything about the A7 just feels right. From that elongated, impossibly sleek silhouette to the high-tech, high-spec interior that just oozes style and class. Audi describes the interior as "a futuristic lounge-type ambience" - designed around three complementary high-resolution screens that control a full range of cockpit management, infotainment and driver information. The A7 is blessed with an arsenal of electronic safety and driver aides - 39 of them to be exact - some of which resonated more than others. The active lane-departure system, for instance, occasionally felt too intrusive for me - taking control of the wheel to steer the car back towards its preferred line. There was a strange, buzzing sensation occasionally coming from the accelerator pedal that had me baffled - and slightly annoyed - until I finally realised it's a haptic alert to the driver to lift and save fuel - for instance when the car detects a lower upcoming speed limit or traffic light - making it appropriate to glide. Amazing. Audi also promises two new features to arrive in coming months - a Parking Pilot and Garage Pilot function that will allow owners to remotely park their A7 into cramped, barely-big-enough spaces via a smartphone app. Or, if you prefer to be inside the car while you park it, there's also a phenomenal 360-degree camera system that utilises four cameras and 12 ultrasonic sensors to prevent any bumps and scrapes. Audi seems to conjure up a clever new trick for every new model we drive - some of them amazingly thoughtful. In the A7 it's a little LED light around the border of the seat-belt buckle - making it a breeze to find in a dark cockpit. Simple but brilliant. Outside, highlights include eye-catching matrix LED headlights that perform a cool light show when the car is unlocked. Massive 21-inch wheels gave the car an even more athletic stance. Dynamically, the A7 is impressive. The 3-litre turbo V6 is a good one and perfectly matched to this car. It delivers sufficient low-down grunt (500Nm) to instantly respond when accelerating from a standstill, or zipping past some tardy traffic, and can be dialled up to feel impressively sporty (250lW) when desired. Yet it empties the fuel tank at a relatively modest rate (7.3L/100km) for a car of this size and capacity. That's in part delivered by a "mild hybrid" system that boosts the petrol engine with up to 12 kilowatts of regenerative electric power, delivered via a belt alternator system. That also contributes to a smart 0-100km/h sprint of 5.6 seconds - not blindingly quick but more than ample for anyone not planning to enter Bathurst this year. A deployable rear wing gives it an even more sporty persona, even if it's more for show in a country that lacks Germany's high-speed autobahns. Ride and handling is exemplary, particularly, for those models fitted with an air suspension that's part of an $8000 enhancement package. Audi's quattro all-wheel-drive completes the safety picture. The familiar seven-speed dual-clutch auto is efficient but every so often seems a little unconvincing - not a deal-breaker by any means, but one of the few weaknesses we could find. Beneath that raking rear window sits a very usable 535 litres of cargo space - or 1390 with the rear seats folded flat - perfect if you've got two or more sets of golf clubs to accommodate. Audi has made no secret of its aim to become Germany's premier car maker, and this car is another emphatic statement of that intent. With the A7, Audi is as close to that goal as it has ever been. HOW BIG? A full-sized executive five-seater - although rear-seat room is compromised a bit by its low-slung roof. Masses of useful cargo space, though. HOW FAST? It stops just short of high-performance territory but it's supremely driveable and with as much go as any average driver could need. HOW THIRSTY? A mild hybrid system helps it achieve a frugal 7.6L/100km. HOW MUCH? Prices for the A7 start at about $113,000 - as tested it's $131,900 plus on-road costs.